(Phys.org)—A team led by Michael Westaway, an anthropologist with Australia's Griffith University, has found evidence that suggests a skeleton found protruding from an Australian riverbank two years ago is the remains of an ancient Aborigine man who died of what might have been a strike by a boomerang. In their paper published in the Cambridge Press's, Antiquity, the group describes the skeleton, what they found during their analysis and why they believe it might represent the victim of a boomerang attack. The skeleton was discovered in 2014 by an Aboriginal man living in the area—the locals subsequently named it Kaakutja, which means "older brother" in the Baakantji language. It was initially believed that the skeleton had belonged to a man that had been killed by someone with the British Native Police, a group that was responsible for killing many Aborigine people not long after Europeans arrived in Australia in the 1800s. But testing by the researchers showed that the man died in the 1200s, well before Europeans arrived with their metal weapons. Analysis of the skeleton revealed a large cut to the face that had gashed the bone running from the brow to the chin that had not healed, suggesting it was part of the reason for the man's death. They also found that two of the man's ribs had been broken and that part of his arm had been cut off. They also noted the skull had two healed wounds, suggesting that the man had been involved in more than one violent encounter. But it was the head wound the team found most intriguing because it looked so much like a wound typically caused by a metal weapon. To better understand what may have caused the head wound, the researchers studied paintings that had been done on rocks in the vicinity, which had been dated to around the same time as the skeleton—they noted that the paintings depicted people wielding Lil-lis, a type of knife-like wooden weapon, and boomerangs. The team noted that either type of weapon could have been used to inflict such a long wound, but suggest that the boomerang seemed more likely because there were no wounds to the forearms, which typically occur in hand-to-hand combat. A tossed boomerang would have taken an arced path toward its victim, allowing for slipping behind a shield if the victim had been holding one. Skeletal remains from a burial in New South Wales exhibit evidence of fatal trauma, of a kind normally indicative of sharp metal weapons, yet the burial dates to the mid thirteenth century—600 years before European settlers reached the area. Could sharp-edged wooden weapons from traditional Aboriginal culture inflict injuries similar to those resulting from later, metal blades? Analysis indicates that the wooden weapons known as 'Lil-lils' and the fighting boomerangs ('Wonna') both have blades that could fit within the dimensions of the major trauma and are capable of having caused the fatal wounds. I throw boomerangs for sport, and they are not weapons. They are lightweight and fly too high to be effective as weapons. Additionally, because of the outward curving arc of the flight, if it was used as a weapon, it would be useless against anything inside or outside of it. In other words, like throwing a knife that only had a range of 30 feet: Not 29 or sooner. Not 31 or later. You'd have to always adjust your range to match your target, inefficient as hell. There were non-returning killing sticks that boomerangs evolved out of, and those things are lethal. Users of them were very proficient and accurate, and any game inside 300 feet was toast. I can imagine this poor fellow was a victim of one of those. I just get tired of not being able to carry my more fragile boomerangs with me on a plane because it's "a weapon" when in reality it's the equivalent of a frisbee. And always having to address misconceptions of the capabilities and purpose of them. One of those deadly killing sticks is seen in the picture in the article, second from left. That would not return, and would be extremely accurate to a practiced thrower. Probably has a range of 3-400 feet due to the lift generated from its imparted spin. It would fly perfectly straight, not around in a circle like a boomerang. I've known since a kid that there were two types of boomerang. The familiar returning type which everyone knows as well as the heavier non-returning type for hunting. Why is this surprising, it's history? I've made both types. The aerodynamics of the boomerang are perfect for stable flight and it can easily be made very heavy and still fly straight like a frisbee. It has to be purposely made light with too much lift for it to be the returning type. Sorry but I will trust the opinions of experts over those of hobbyists who can't be bothered to research even a little. 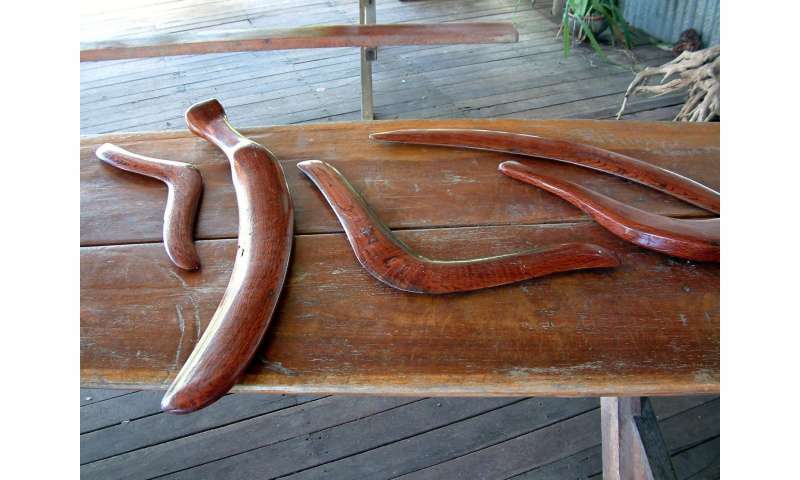 "The most recognisable type of the boomerang is the returning boomerang; while non-returning boomerangs, throwing sticks (or shaunies) were used as weapons, returning boomerangs have been used primarily for leisure or recreation." Uh, I think your citation is in agreement with the post you are disagreeing with???? Uh, the gentleman was redefining the term to exclude 'killing sticks'. Boomerangs include both the returning and non-returning weapons types, which the author knew but the amateur didn't. The amateur thought he could correct the expert because he threw Boomerangs. People pull that crap here all the time. Should we let it stand? No. wo years ago is the remains of an ancient Aborigine man who died of what might have been a strike by a boomerang. Yes, but the real question is: was it his own boomerang? Uh, the gentleman was redefining the term to exclude 'killing sticks'. Uh, no he was not. You just stopped reading after his first paragraph. Here's the second: "There were non-returning killing sticks that boomerangs evolved out of, and those things are lethal. Users of them were very proficient and accurate, and any game inside 300 feet was toast. I can imagine this poor fellow was a victim of one of those." Strike my last. I see what you are saying and I stand corrected. Why how refreshing. Hey aa did you read this? Wanna try it sometime? I don't know what "crap I was trying to pull" in your opinion. I made no claims of expertise, simply expressed the same frustration that all boomerang throwers have experienced sooner or later. Anthropologists apparently don't distinguish clearly enough between returning (benign non-weapons) and non-returning (lethal, incredibly deadly accurate weapons) boomerangs any more than the general public does. My experience is that I lost a very expensive boomerang that was confiscated because it was "a weapon", because I didn't want the temperature and pressure of the cargo hold to change the curve. I have also experienced the same thing that almost all throwers experience sooner or later, and been threatened with arrest for using a weapon in a public park. Simply because not enough distinction is made between the two types. Apparently, anthropologists aren't affected enough personally. If you feel I was trying to defraud anyone, I am a bit confused why you jump to that kind of extreme. So allow me to restate the intention of my first post, since it has apparently caused some confusion. DISCLAIMER! I AM NOT AN ANTHROPOLOGIST! A lot of people think that boomerangs are weapons. That means they think all boomerangs are weapons. That leads to loss of joy and is the cause of sorrow for people that throw non-weapon boomerangs. Not all boomerangs are weapons. People who throw boomerangs for fun will, as a knee jerk reaction to any mention of boomerangs, make this point, especially if it has cost them boomerangs or jail time. Once again, I AM NOT AN ANTHROPOLOGIST. This was my only intention. I did not intend to defraud anyone, or claim an expertise I do not possess, since DISCLAIMER! I AM NOT AN ANTHROPOLOGIST. Thank you for allowing me to clear this up. I would not want any crap to stand here. I am not an anthropologist. So you didnt bother to google my excerpt? -and yet you felt qualified to redefine boomerangs to exclude throwing sticks, and criticize the expert in the article whom you should have known knew more than you about the subject. That meets the definition of 'crap' I think. Contrition would have been a lot easier than your 2-post crap-on-crap huffiness dont you think?